PROUD MEMBER OF THE GUILD OF DOG TRAINERS. ﻿Obedience, agility, puppy training, companion dog training, behavioural issues, diagnosing & solving various types of aggression issues using different training techniques to suit the dog and not one size fits all training as every dog and its owner are very different. Distinctions in canine work through various nationally recognised organisations. Michael is K9 TRAINING SERVICES head trainer with over 20yrs of dog training experience and trains dogs in obedience, tracking & protection and is an approved trainer/instructor for NASDU delivering their General Purpose Security Dog & Handler Level 2 & 3 training courses. This is a nationally recognised GP Security Dog Handling qualification & the awarding body is HABC (Highfields Awarding Body of Compliance). Michael is also an accredited KCAI (Kennel Club Accredited Instructor). Michael also assesses dogs for the magistrates courts, these dogs have been seized under the Dangerous dogs Act for one reason or another. Usually when a dog is seized under the DDA Michael is instructed by the courts or by the solicitors of the client who owns the dog to do an initial assessment which will help the courts make a decision on any subsequent control orders that may be placed on the dog depending on the out come of the assessment among other factors, the assessment is a 30 point assessment done usually at the Police kennels or Police training grounds or sometimes at the discretion of both the courts & police it can be done at our training grounds in Kent. NASDU L2 & 3 GP Security Dog Handler Courses. 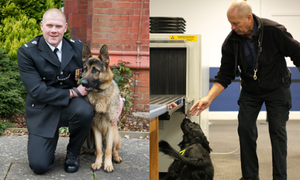 HABC awarding body of compliance is a nationally recognised qualification for the Professional GP Security Dog Handler. 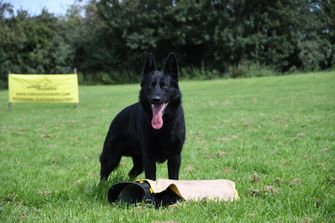 Course syllabus includes legislation, internal & external search work, control access & egress, powers of arrest, weapon attack, distance control, tracking, protection work, inspection & grooming, Health & Safety are just a small taste of what is covered on the courses to meet National occupational standards (NOS) for a GP Level 2 & 3 Security Dog Handler and the training requirements contained within BS 8517-1:2009. Drug Detection, Explosives, SIA, First Aider courses arranged also. Michael has various qualifications in various canine related sectors ranging from KCAI/City & Guilds/CIDBT/ NASDU/KCGCDS to name a few. Michael having met certain criteria as well as completing a KCGCDS examiners course is also an approved instructor for the Kennel Club GCDS (Good Citizen Dog Scheme) the largest dog training scheme in the UK & is an accredited A list examiner for the KCGCDS. Michael is also a member of the BIPDT (British Institute of Professional Dog Training). Please make sure whoever you trust your beloved dog to they actually have the necessary qualifications and practical experience to begin to understand your dogs mind and its behavior as far to often we see clients and their dogs that come to us that have been messed up with so called dog trainers forcing aggression or using incorrect out dated training methods on the dogs without little thought to the consequences, or mis diagnosing what they are seeing and sending owners away with misguided incorrect information or by telling dog owners to fix a problem you need to use harsher training methods. Michael says so many times I have been to dog training clubs and left because the trainer does not understand the dogs mind and trains all breeds the same way or far to harshly, dogs are like us in many ways they feel, think, and are different in the varying traits they have to their specific breed. We train dogs using their natural drives and get results without harsh dog training techniques that have no place in the dog training world and training methods have moved on from what it was 15 or even 10 years ago. We first ask you what you want to achieve with your dog whether its basic obedience, agility, high level home personal protection work, IPO training, Security Guard Dog training, we then assess you and your dog and tell you what the realistic chances of success with the dog you have are and not just tell you what you want to hear as we don't believe in wasting your time or ours. If you just want fun dog training or companion dog training at a friendly dog training club thats great just come along get involved and feel part of a club that wants to see you and your dog do well no matter what type of training you decide on or what breed of dog you have. 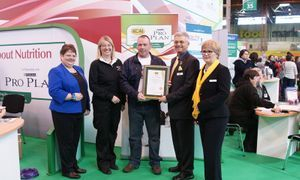 What makes us different then everyone else check out our accreditation and see for yourself ? We have spent all our lives training dogs and have the accreditation to back it up do others ? 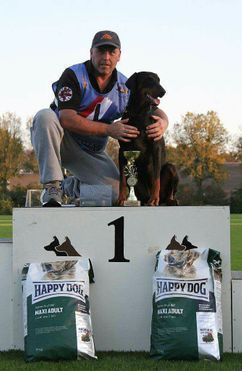 We are professional trainers and dog handlers that also compete at the highest level with our dogs. Licensed Dutch Helper: Michael is also a licensed Dutch Helper having worked under the guidance of international & world championship helper Mr Ruud Broeders, the examining judge in Utrecht was Dhr.Rick Zainal from Holland. KENNEL CLUB A LIST EXAMINER: For the Kennel Club Good Citizen Dog Scheme (A list examiners have completed the KC Approved GCDS Examiners course and have been assessed by 3 KC assessors before passing the course). NASDU: Approved Instructor/Trainer GPSDH Level 2 & 3. UKDA: Licensed IPO tracklayer & IPO bitehelper (Assessed by Mr Simon kwak from Holland, Mr Simon Kwak is a world championship judge for the FCI). WE HAVE FULL PUBLIC LIABILITY INSURANCE FOR BOTH PET DOG TRAINING AND SECURITY DOG & HANDLER TRAINING. MAKE SURE YOUR TRAINER HAS THE CORRECT PUBLIC LIABILITY INSURANCE AS THE VAST MAJORITY OF DOG TRAINERS HAVE NO INSURANCE IN PLACE. WE ARE ALSO INSPECTED BI-ANNUALLY FOR COMPLIANCE. Michael with one of his dogs a 2 and half yr old female Dobermann who recently gained their IPO2 at the Dutch Nationals and also gained the Dutch Youth Working Champion title of 2017 as well as the 2017 Dutch Female Working champion. Michael is the first ever UK dog handler and first ever dog that has gained the Dutch Youth Working Champion Title and the Dutch Female Working Champion Title all within a 6 month period a truly fantastic achievement and done it 2 years in a row. Michael is a qualified NASDU level 2 GP Dog Handler and was also an accredited & approved NASDU Instructor/Trainer his emphasis is on delivering quality accredited training to National occupational standards (NOS) for a GP Level 2 & 3 Security Dog Handler and the training requirements contained within BS 8517-1:2009 for security dog training. If you need your NASDU Level 2 & 3 General Purpose Security Dog Handler Courses, drug detection, SIA, First Aider courses booked just give us a call to find information on our next available course dates. Or alternatively click on the link below for our next available course dates & offers. We deliver Pet dog training to Kennel Club, Guild Of Dog Trainers & British Institute Of Pet Dog Trainers guidelines using the most up to date training methods without the harsh training, utilising the dogs drives & traits so its fun for both the handler & dog. JOIN OUR FACEBOOK PAGE FOR UP TO DATE POSTS,COMPETITIONS AND GENERAL INFORMATION. Michael trains in Schutzhund - IPO or as its going to be soon known as IGP and is the UKDA (United Kingdom Dobermann Association) President & Working Dogs Director as well as being the President of the United Kingdom Belgian Shepherd Working Dog Association. We hold scenario based GP Security Dog Training which includes crowd control, weapon attack, radio communications, person & building search & more. We separate pet dog training from security dog training and IPO training so you have the choice of what you would like to do depending on both the dog & handler capabilities. We will help you keep up to date with all the relevant Legislation including the Dangerous Dog Act 1991 including the new amendments regardless of what type of training you do as its relevant to all dog owners. UKDA: Michael is the UKDA (United Kingdom Dobermann Association) Working Dogs Director and also the President of the UKBSWDA (United Kingdom Belgian Shepherd Working Dogs Association) and holds working trials throughout the year as well as ZTP. Check out our Schutzhund / IPO Website if you want this type of training as it is very different to pet dog training IPO requires more dog/handler focus and high drive dogs among many other attributes. We use the natural drives of the dogs, but few dogs are suitable for IPO Working Trials. We can put you in touch with recommended working kennels for the right dog. Please feel free to browse through our site but please don't copy anything and if you like our site save it in your favorites list. Webmasters please don't copy anything from our site instead please put a link back to us from your site. K9 TRAINING SERVICES ARE PROUD TO SUPPORT BATTERSEA SERVICE DOG SECTION. WE NOW WORK CLOSELY WITH MR KEITH PAYNE IN PROMOTING RESPONSIBLE SERVICE DOG TRAINING & OWNERSHIP OF SERVICE DOGS HERE IN THE UK. WE ARE CURRENTLY TRAINING SEVERAL DOGS FROM BATTERSEA SERVICE DOG SECTION AND I CAN HONESTLY SAY WHAT A PLEASURE TO SEE POTENTIAL SERVICE DOGS THAT ARE NOT AGGRESSIVE AND WOULD BE A WELCOME ADDITION TO ANY SERVICE DOG HANDLER LOOKING TO TAKE ON A WELL BALANCED DOG. ALL DOGS ARE CHECKED FOR SUITABILITY FOR THE SERVICE SECTOR, ALL POTENTIAL DOG HANDLERS ARE HOME CHECKED FOR SUITABILITY SO DONT BE OFFENDED WHEN EITHER KEITH OR MICHAEL MC CANN FROM LONDON DOG TRAINERS ASK TO HOME CHECK YOU AS WE WANT FOREVER HOMES FOR THESE DOGS. AS HOPEFULLY YOU WILL BECOME A TEAM AND HANDLER/DOG COMPATIBILITY IS PARAMOUNT TO ENSURE FOREVER HOMES. There is a misconception that you need to get a dog from a puppy or start training them really young while this is somewhat true Canines can learn at any age just like us humans can so don't be put off training with your dog no matter what age they are. We have worked with many different breeds and yes indeed some are easier to train than others and one of the most common questions we get asked is which Dog Breed is right for me here K9 TRAINING SERVICES can give you the information that will help you decide which dog is most suited to you & your lifestyle like for instance do you live in the city or the country, do you have children, other dogs, do you live in a house or an apartment etc, there are various things to consider before you even think of getting that cute puppy you saw at the breeders or the dog you are about to rehome from your local rescue centre, puppies won't stay that little for too long and the dog you are about to rehome ask yourself does it have behavioural issues has it aggression issues with other dogs or humans, why was it left at the shelter these are all questions you should ask after all this puppy or adult dog will be with you for a long time to come. So as you can see there is lots of things to think about before you decide on what Dog Breed is right for you & your family. Just check out our Dog Breeds page for a little more advice on the different dog breeds that are out there it may just help you decide. And remember patience is the key in training your dog. K9 TRAINING SERVICES can assist you in this by coming to your house or if you prefer meet you in your favourite park or place of work and then go through the various routines & techniques London Dog Trainers have acquired through their years of practical and academic experience. There is no such thing as a bad dog just inexperienced dog owners who may have been given the wrong advice we can all learn something new it's never too late contact london dog trainers we can and will help you and your dogs. Always treat your dog with the love & respect they deserve because if you do they will return it ten fold and they look to you for direction and guidance. Eire Stamm K9 Working Kennels supply only the finest working lines of Malinois - Dobermann - German Shepherds for the security, personal protection & sport sectors. K9 TS the UKBSWDA & UKDA ESSEX/KENT IPO Club is pleased to announce a specialist training day. STARTS AT 9AM IN KENT Call us to register your interest. WE HAVE ACRES OF TRACKING AREA AS WELL AS AREAS FOR PURSUIT TRACKING SO COME ALONG EVEN IF ITS YOUR FIRST TIME TRACKING IT WILL BE A FUN LEARNING EXPERIENCE.